California mixed media artist, Sara Zimmerman, has come up with an innovative idea to combine her passion for the visual medium with her love for the environment -- helping to save on the cost of materials along the way. Zimmerman, a fine artist working out of the Lake Tahoe area, has begun to utilize discarded cabinet doors, such as those replaced during construction, as well as paper and other recycled materials, as a mixed-media canvas for her art. Part of a growing creative community along the Northern California/Nevada border, Zimmerman's work as a mix-media painter has long juxtaposed urban and natural landscapes with the detail of close-range subjects. With the Sierra region as both subject and inspiration, it's not surprising that the artist's work would reflect the beauty of the environment that surrounds her studio. The concern about the quake-formed lakes was exacerbated by a 6.0 aftershock -- one of over 94 recorded strong aftershocks -- on Sunday that was reported to have killed four more, injured 1,000, to have damaged another 400,000 structures and to have threatened another dam. One of the expedition's scientists, Derek Mueller of Trent University, Ontario, [reported]: "I was astonished to see these new cracks. "It means the ice shelf is disintegrating, the pieces are pinned together like a jigsaw but could float away," Dr Mueller explained. 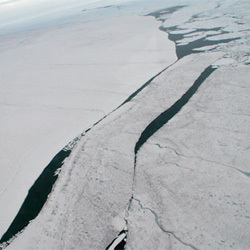 Scientists now report a 23% loss of sea ice due to climate change in the last year alone, citing the changes in the ice shelves as impacted by the same forcings. The Bay Area fees are expected to generate $1.1 million in the first year to help pay for programs to measure the region's emissions and develop ways to reduce them. More than 2,500 businesses will be required to pay the proposed fees. About seven power plants and oil refineries would have to pay more than $50,000 a year, but the majority of businesses would pay less than $1, according to district estimates. T. Boone Pickens, Jr., the Texas billionaire oilman, is planning to put billions into a 4,000 megawatt wind farm in Texas with the capacity to power 1.3 million homes. Pickens said he will be purchasing GE Turbines to install in central Texas from 2010 to 2015 on a royalty share basis with landowners in order to obtain access to wind. "The Department of Energy came out with a study in April of '07 that said we could generate 20 percent of our electricity from wind. And the wind power is -- you know, it's clean, it's renewable. It's -- you know, it's everything you want. And it's a stable supply of energy. A turbine will generate somewhere around 20,000 [dollars] a year in royalty income [some of which to benefit those who put them on their land]. And on a 640-acre tract, you can put five to 10 of these on the tract. And you don't have to have them if you don't want them." In the 1949 film, “A Letter to Three Wives,” three women receive letters from an unseen character telling them that she, their friend, Addie Ross, had run off with one of their husbands. Since the Joseph Mankiewicz film dropped two of the “Five Wives” of the original story on which it was based, I feel free to drop one wife more for the purposes of this post. The letter I write below is to Michelle Obama, and to Cindy Hensley McCain, and I’m not the kind of guy to run off with either of your husbands. No Addie Ross me. But one of you will discover what it is to be deeply disappointed and sadly surprised this year, when your beloved spouse loses the big one and disappoints your hopes for him, and yourself. Both of you are strong defenders of your husbands, while being women of accomplishment. But only one of you has come under attack of the main stream press, and that says something about America today that’s worth exploring. "We are extremely worried that many children in the affected areas are now suffering from severe acute malnourishment, the most serious level of hunger," said Jasmine Whitbread, who heads the agency's operation in Britain. "When people reach this stage, they can die in a matter of days." International outrage has been growing at the Myanmar Junta's obstructive behavior and unwillingness to allow experts and aid into the devastated region. This has prompted the U.N. Secretary General, Ban Ki-moon, to send U.N. humanitarian chief John Holmes to Myanmar this weekend. "He's going at the request of the secretary-general to find out what's really going on the ground, to get a much better picture of how the response is going and ... to see how much we can help them scale up this response," [Amanda Pitt, a U.N. spokeswoman in Bangkok] said. Details of the visit, she said, were still being worked out. The U.N. report said all communications equipment used by foreign agencies must be purchased through Myanmar's Ministry of Posts and Communications -- with a maximum of 10 telephones per agency -- for US$1,500 (euro960) each. Importing equipment is not allowed. There have been reports of the Junta taking the limited aid that has been allowed in and distributing it to those associated with their regime, stockpiling it in warehouses and/or selling it at inflated prices on the Yangon market. Britain's prime minister has directly accused the Junta of preventing aid from reaching victims and said "the military regime cares more about its own survival than it's people's welfare." "This is inhuman," Gordon Brown stated. Wildlife numbers plummeting: "A great extinction is underway"
The World Wildlife Fund, in conjunction with the Zoological Society of London, has released a report that concludes more than one in four of all wildlife species has been lost since 1970. Populations of land-based species fell by 25%, marine by 28% and freshwater by 29%, it says. Humans are wiping out about 1% of all other species every year, and one of the "great extinction episodes" in the Earth's history is under way, it says. Pollution, farming and urban expansion, over-fishing and hunting are blamed. Some of the worst hit are marine species which saw their numbers plummet by 28% in just 10 years, between 1995 and 2005. Populations of ocean birds have fallen by 30% since the mid 1990s, while land-based populations have dropped by 25%. Among the creatures most seriously affected have been African antelopes, swordfish and hammerhead sharks. Another, the baiji - or Yangtze River Dolphin - may have been lost altogether. Obese and overweight people require more fuel to transport them and the food they eat, and the problem will worsen as the population literally swells in size, a team at the London School of Hygiene & Tropical Medicine says. This adds to food shortages and higher energy prices, the school's researchers Phil Edwards and Ian Roberts wrote in the journal Lancet on Friday. At least 400 million adults worldwide are obese. The World Health Organization projects by 2015, 2.3 billion adults will be overweight and more than 700 million will be obese. The deadly China earthquake's toll continues to rise, with an estimated 50,000 dead and an entire region's infrastructure impacted. This includes 15 million tons of carbon that have been subject to offsets -- the barter system that allows developed nations to trade their pollution credits with developing nations, thereby providing an incentive for new infrastructure to be built in a carbon neutral manner -- within a 150 kilometer radius of Monday's quake centered in China's Sichuan province. "We counted seven impacted companies among the world's top 20 project developers," said Laurent Segalen, Lehman head of emissions trading, who listed EcoSecurities, Deutsche Bank, Endesa and Mitsubishi Corp among developers with nearby projects. They included projects to cut greenhouse gas emissions from chemical plants or by replacing fossil fuels using wind and hydropower. Stockholm-based project developer Tricorona said on Thursday that it had over 10 offset projects in Sichuan that it said may have been affected and corresponded to 8 million tonnes emission cuts through 2012. Carbon offsets are an essential part of greenhouse gas emission control of China's growing emissions caused by the ongoing development of coal-based plants and the increased automobile usage by their billions of citizens. The companies involved have not been able to assess the damage on their individual projects, but, given the scope of the destruction, it is a likely assumption that the carbon offset projects will be impacted, adding tons of greenhouse gases that would otherwise be taken out of the atmosphere, unless an alternative arrangement can be worked out in time. A new website (firethelobbyists.com) has been created by Campaign Money Watch, to convince Senator McCain to fire three lobbyists working on his campaign that have ties to ruthless dictators. You may recall that over the past two days, two McCain aides have resigned because of their willingness to do public relations work for the Burmese Junta. "John McCain ought to immediately fire three lobbyists — Charlie Black, Tom Loeffler, and Peter Madaigan -- whose lobbying for brutal dictators and foreign governments is every bit as bad as the two lobbyists who left his campaign over the weekend. Frankly, McCain's campaign is turning out to be an effort of, by, and for these types of Washington influence peddlers. His credentials as a reformer are gone." “While the legal standards under the ESA [Endangered Species Act] compel me to list the polar bear as threatened, I want to make clear that this listing will not stop global climate change or prevent any sea ice from melting," Interior Secretary Dirk Kempthorne says in a statement. The move requires the government to protect the species and to take measures to help the bears survive, an important consideration and the likely reason for the delay, as this is the first time a species has been listed due to climate change. The Natural Resources Defense Council and other environmentalist groups that sued the government to force the decision has said they will fight to for regulations on emissions that they cite as the causal relationship to the melting ice that is harming the bears. "This is a profound acknowledgment of the threat not only to polar bears but to the entire Arctic ecosystem," said Andrew Wetzler of the Natural Resources Defense Council. "It is going to provide important protection for polar bear populations." Cyclone Nargis' ten hour devastation of Myanmar/Burma last Saturday is quickly emerging as a humanitarian catastrophe, leading their repressive and secretive military junta to take the unprecedented step of requesting international aid, while resisting granting the visas to allow those aid agencies and government organizations the access needed to bring those supplies to the impacted areas. Reports of Cholera and Malaria in the cyclone zone have now been confirmed. The U.S. was able to land one transport plane with mosquito nets and water purification supplies. The Myanmar Junta has said they will let two more planes in. Concern is growing that the regime is either keeping the supplies for themselves, distributing them only to those with relatives in the military or otherwise connected to the regime and/or selling them on the inflated open market. (NGO's accepting donations for this disaster: World Vision, Red Cross Red Crescent, America Burma Buddhist Assoc., Global Giving, Doctors without Borders, UN World Food Program). YANGON, Myanmar (CNN) -- The death toll from the Myanmar cyclone is more than [new U.N. estimate: 100,000] people, Myanmar's Foreign Ministry said Monday. Survivors were facing their third night without electricity in the aftermath of the historic cyclone that also clogged roads with thousands of downed trees. Diplomats were summoned to a government briefing Monday as the reclusive southeast Asian country's ruling military junta issued a rare appeal for international assistance in the face of an escalating humanitarian crisis. A state of emergency was declared across much of the country following the 10-hour storm that left swathes of destruction in its wake. The hardest-hit area was the Irrawaddy region where about 10,000 people died in Bogalay, 90 kms (55 miles) southwest of Yangon. Aid agencies gathered in nearby Thailand are trying to work out access to the country with the regime. International calls to allow access to aid workers have fallen on deaf ears with the military junta. A U.S. carrier group that is in the Bay of Thailand to conduct, ironically, disaster relief exercises, could have helicopters with relief supplies and experts in the effected areas within hours, but thus far, has not received permission from the Myanmar regime to land. The U.S. government is now asking China, a Myanmar trading partner, to get the reclusive regime to grant permission. These attempts, thus far, have been unsuccessful, leaving the USS Essex and its tons of relief supplies, marines and disaster relief experts to watch the growing humanitarian disaster in horror and frustration. The U.N. Secretary General has issued a statement to say that he was "deeply saddened by the loss of life and the destruction suffered by the people of Myanmar" and has promised international support. No word, as yet, from the Myanmar regime's main trading partner, China, or from the oil and gas companies that do business with them. Scenes of the destruction showed extensive flooding, boats on their sides in Yangon harbor, roofs ripped off buildings, uprooted trees and downed power lines after cyclone Nargis battered the Irrawaddy delta with 150 mile (241 km) an hour winds throughout Friday night and Saturday morning, dumping 20 inches of rain. The death toll and ongoing humanitarian crisis within the already devastatingly poor population is expected to worsen as are the tensions between the government and their opponents, led by the country's Buddhist monks, whose protests against the junta were put down with violence last fall. President Bush has pleaded with the junta to "let the United States come in and help you." First Lady, Laura Bush, in a rare press conference, announced: "Although they were aware of the threat, Burma’s state-run media failed to issue a timely warning to citizens in the storm’s path,” Mrs. Bush said in a rare news conference at the White House. “It’s troubling that many of the Burmese people learned of this impending disaster only when foreign outlets, such as Radio Free Asia and Voice of America, sounded the alarm." The American Embassy in Myanmar has authorized the release of $250,000 [now $3 million] in immediate emergency aid, and Mrs. Bush promised, “More aid will be forthcoming." A disturbing new survey has reported that 36.1 percent of commercial honeybee colonies have been lost, the majority due to mysterious phenomenon known as colony collapse disorder (CCD) where the bees abandon their hives and disappear. SAN FRANCISCO, California (AP) -- A survey of bee health released Tuesday revealed a grim picture, with 36.1 percent of the nation's commercially managed hives lost since last year. Last year's survey commissioned by the Apiary Inspectors of America found losses of about 32 percent. About 29 percent of the deaths were due to colony collapse disorder, a mysterious disease that causes adult bees to abandon their hives. Beekeepers who saw CCD in their hives were much more likely to have major losses than those who didn't. The University of Pennsylvania has received emergency grants of ~$80,000 to investigate the problem. These funds have been supplemented by up to a $250,000 grant from Haagen-Dazs Ice Cream Company to be split between the university and U.C. California Davis. The ice cream company relies upon honeybees for pollination of plants that provide many of the natural flavors used in their products. Senators Hillary Clinton and John McCain have challenged Senator Barack Obama over his refusal to support their proposal that would suspend the .18 Federal gas tax for three months this summer. A near-unanimous chorus of protests from experts, economists and environmentalists, all of whom support Senator Obama's position that the 'holiday' would net less than thirty cents a day for consumers -- if indeed any net at all -- since, historically, oil companies have absorbed the savings without passing them on, while gutting the transportation infrastructure trust fund that is the source of income for thousands of American workers and the safety net for our highways and bridges that are currently crumbling. Environmentalists have also added that it would likely lead to more gasoline usage as at time when we need to reduce our carbon footprint due to the impact of climate change. The lone 'expert' in support of Senators Clinton and McCain in this scenario so far? Spokesman for the Clinton campaign and SHELL OIL LOBBYIST, Steve Elmendorf. “I was appalled by Hillary going with the gas tax,” said Alice M. Rivlin, a budget director under former President Bill Clinton who supports Mrs. Clinton for the nomination. It “looked like pandering,” Mrs. Rivlin said. An open letter signed recently by more than 100 economists said the proposed tax holiday would do little to reduce gas prices. In part, that is because a fall in prices would lead to more demand, which would cause prices to return to their earlier level. The result would be that overseas oil-producing governments would get money now flowing to the United States government in gas taxes. Recently, I posted an article by Huffington Post contributor, Terry Leach, entitled: Hillary Clinton's 'Victory' in Pennsylvania: The Rush Limbaugh Effect. The article discusses the potential impact on the primary numbers by those influenced to change their registration from Republican to Democrat, in order to vote for Hillary Clinton, as part of Limbaugh's "Operation Chaos." Rush Limbaugh: 'I stumbled across something called The Environmentalist.org, but it's a blog on environmentalists. It was posted on Saturday: "Hillary Clinton's 'Victory' in Pennsylvania: The Rush Limbaugh Effect." And he goes on to analyze what all happened there. He said, "Something's not right." He goes on to analyze even more, and then says, "I believe that Rush's Operation Chaos is at play here and authenticity has nothing to do with too may new Democratic registrants in the last contests. This re-registration is, I believe, being undertaken at Rush's suggestion to cynically stretch this contest out -- as long as possible -- so that Hillary's promised kitchen sink theory -- will end up driving both candidates' negatives through the roof so that neither is likely to win against McCain. Voters in upcoming contests will always be swayed by the outcome of preceding contests. It's human nature to be influenced by the wisdom of those who've gone before us. But if I'm right -- and the outcome in Pennsylvania, and perhaps Mississippi, Texas, and Ohio were influenced by Rush's call to Republicans to keep Hillary in the race longer --Democratic voters in Indiana and North Carolina, and the states that follow, deserve to know that we're being manipulated." THE ENVIRONMENTALIST is a very friendly blog (site, actually, we don't take comments), where contributors post about geopolitics, the environment and other subjects of interest -- not as a rule on environmentalists themselves -- and Terry Leach, a respected activist and former Democratic strategist, is a she, not a he. Ms. Leach's response, upon hearing of Mr. Limbaugh's broadcast: "it is human nature to dismiss those out-of-hand that you either don't respect, those that you don't wish to empower or to acknowledge as to the impact of their actions. However, if there is any truth to the possibility that "Operation Chaos" is having an impact, it should be explored to determine if those changing their registration are doing so out of their own beliefs or because they hope to influence the process." Mr. Limbaugh closed by saying "everyone is talking about Operation Chaos." Apparently, thanks to Mr. Limbaugh, they are now talking about THE ENVIRONMENTALIST, as well. The Friends of the Earth Action, the PAC political arm of The Friends of the Earth environmental organization, has endorsed Senator Barack Obama for President, citing Senator Obama's stand for "real energy solutions instead of sham Clinton-McCain ‘gas tax holiday’" as the key reason for endorsement. WASHINGTON, D.C.—Friends of the Earth Action, a national environmental group based in Washington, D.C., announced today that it is endorsing Senator Barack Obama to be the nation’s next president. Experts agree that gas prices are likely to decline only slightly under a Clinton-McCain “gas tax holiday”—if they decline at all. Instead of signing onto this gimmick, Obama has called for long-term solutions that would limit oil consumption by requiring cars to be more fuel efficient and expanding transportation options including passenger rail. Blackwelder cited Obama’s strong pro-environment record, his policy proposals, the profile he has given global warming in his campaign, and the broad mandate he is building for change as other reasons for the endorsement. Obama earned a 96 percent rating from the League of Conservation Voters during his first two years in the Senate. Blackwelder said Friends of the Earth Action plans to inform its more than 100,000 activists in the U.S. about its support for Obama and to campaign for him in remaining primaries. Friends of the Earth Action previously endorsed John Edwards in the Democratic primary process and engaged in early state independent expenditures on his behalf. A high end New York food company, Gourmet Boutique, has voluntarily recalled 143 tons (286,000 pounds) of beef and poultry for fear that it may be contaminated with the Listeria monocytogenes bacteria. The Jamaica, NY, company manufactures both fresh and frozen foods. The problem was discovered through sampling by federal and Florida food safety inspectors. No associated illnesses have been reported. Included are specific chicken salad and sandwiches sold under the name Gourmet Boutique, and several frozen wraps and burritos sold under the names "Jan's" and "Archer Farms." The fresh food products have end dates of May 2 and May 3. The company had an earlier voluntary recall, last March, of 7,000 pounds of meat for the same contamination. The company said in a recorded message they had made "environmental changes" at their plants to prevent a repeat of the problem. Listeria monocytegenes is a bacteria that exists in ground water and other sources. It is responsible for the disease Listeriosis which is most dangerous to those with depressed immune systems, although it can be a problem for whoever ingests the bacteria. Fever, muscle aches, nausea or diarrhea. If infection spreads to the nervous system, headache, stiff neck, confusion, loss of balance, or convulsions can occur. Infected pregnant women may experience only a mild, flu-like illness; however, infections during pregnancy can lead to miscarriage. If you find you have these products or have questions, you may contact the company here. 30 days after the Bush Administration removed Yellowstone's Gray Wolves from the endangered list, a lawsuit has been filed by the Natural Resources Defense Council to stop the toll on the small population, now at 37 dead wolves and counting. On the very day that these wolves lost their Endangered Species protection, a crippled wolf named "Limpy," one of the most photographed wolves in Yellowstone's famous Druid Peak pack, was shot to death when he ventured outside the park. Another wolf was stalked for over 35 miles by snowmobile before being overtaken and shot. Another was found dead on the side of the highway, his still-warm body torn apart by bullets. And, tragically, at least four female wolves have been killed just prior to the denning season, which could doom some of the region's wolf pups. The restoration of the gray wolf in the Northern Rockies is one of America's greatest environmental success stories. Wolves were reintroduced to Yellowstone and the central Idaho wilderness in 1995 after being exterminated by settlers, trappers and the federal government. Since then, these new populations have increased to 1,500 or so animals. Wolves play a crucial role in the ecosystems of the Northern Rockies, helping to preserve riparian forests and maintain healthy populations of raptors and coyotes. They are also a boon to the region's economy, generating tens of millions of dollars in tourist revenue each year. But Rocky Mountain wolves are now in grave danger. In March 2008, the Bush Administration stripped gray wolves in Greater Yellowstone and across the Northern Rockies of endangered species protection. Earlier in the year, the administration issued a new rule allowing the slaughter of hundreds of these wolves. Entire packs of wolves could be gunned down from airplanes in minutes. In fact, the federal government has already spent our tax dollars to buy two planes for the purpose of aerial gunning. The Bush Administration's move is supported by trophy hunters who wish to protect the elk population from the wolves so that they may hunt them instead and by ranchers who want to keep the wolves away from their herds.